This is a technical policy brief for the HLPF on Sustainable Development Goal 15 prepared by the Forest Peoples Programme and produced by the Indigenous Peoples Major Group for Sustainable Development. STATE OF INDIGENOUS PEOPLES LAND, TERRITORIES AND RESOURCES FROM NORTH AMERICA, ASIA, PACIFIC AND LATIN AMERICA & THE CARRIBEAN. This publication has been produced with the assistance of the Rainforest Foundation Norway (RFN), International Work Group for Indigenous Affairs (IWGIA) and European Union. 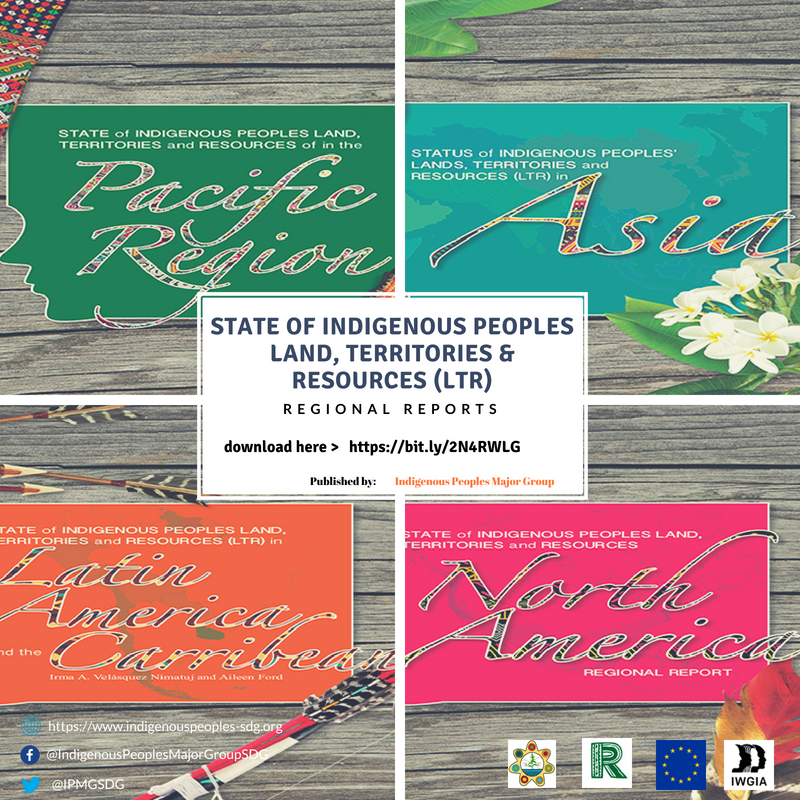 The contents of this publication are the sole responsibility of the Indigenous Peoples Major Group (IPMG) for Sustainable Development and can in no way be taken to reflect the views of the RFN, EU and IWGIA. On 23 March 2019, more than 150 Fulani pastoralists were killed in their village in Ogossagou in Mopti region in central Mali. Smear campaigns, laws and even physical violence are used to stifle people trying to protect their land and way of life. 370 million people in over 90 countries identify themselves as being indigenous. They represent humanity in all its diversity, but they all have in common the fact that they are the most excluded, discriminated, threatened and often the poorest communities worldwide. While indigenous peoples make up 5 % of the global population, they account for 15 % of the extreme poor. The 2030 Agenda and the Sustainable Development Goals (SDGs) represent an unprecedented opportunity to ensure that indigenous peoples are not left behind. The goals can also benefit from indigenous peoples’ knowledge on topics such as community resilience and the environment. Eight short videos have been produced focusing on the themes of a number of key SDGs, presented through the views of indigenous peoples from Bolivia, Colombia, Kenya, Nepal and Thailand and this video covers all topics.